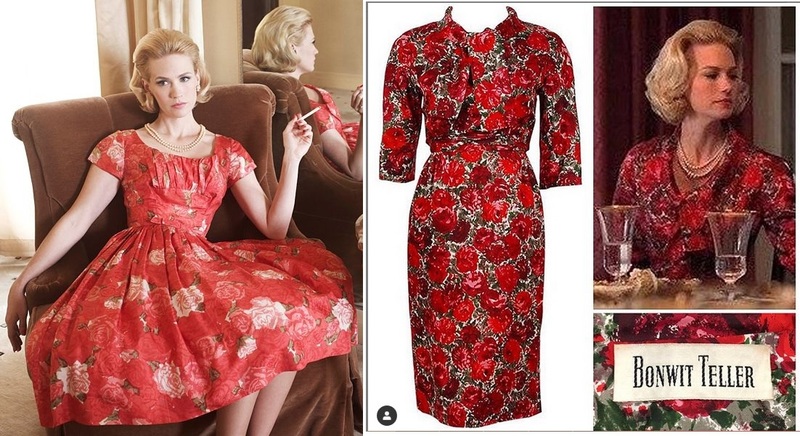 This entry was posted in 1950's and tagged "Mad Men", "Simplicity pattern", "Slenderette" pattern, 1950s, 1950s polished cotton, 1950s red dress, 1950s rose print dress, 1950s wiggle dress, 1958, attached belt dress, beading a dress, Betty Draper, boatneck dress, cotton, dress, hip pleats, kimono sleeves, Mad Men Season Two, retro, seed beading a garment, sewing, sewing with vintage fabric, Simplicity 2727, Valentine's Day dress, vintage, vintage cotton, vintage fabric, vintage red dress, vintage Simplicity pattern, vintage Valentine's Day dress, wiggle dress by kellycb. Bookmark the permalink. Beautiful dress. 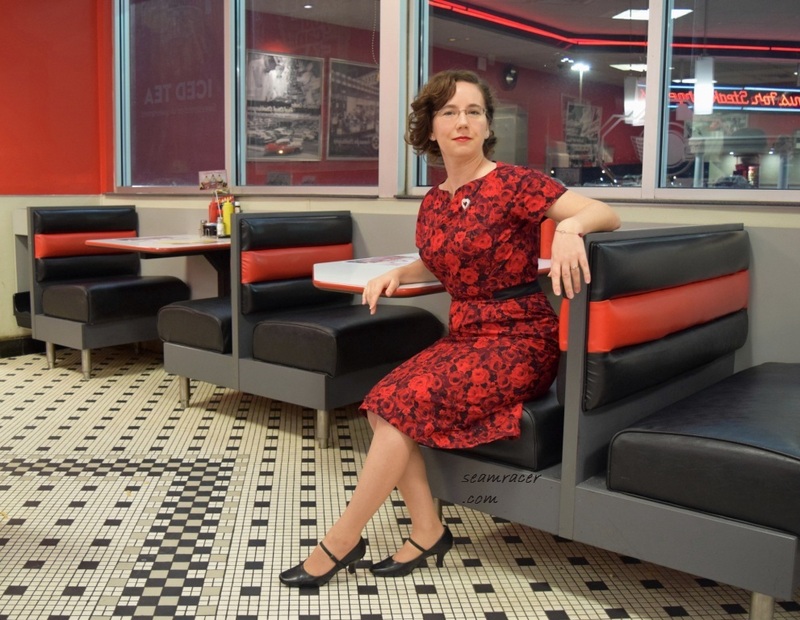 I love the diner setting too! Thank you! 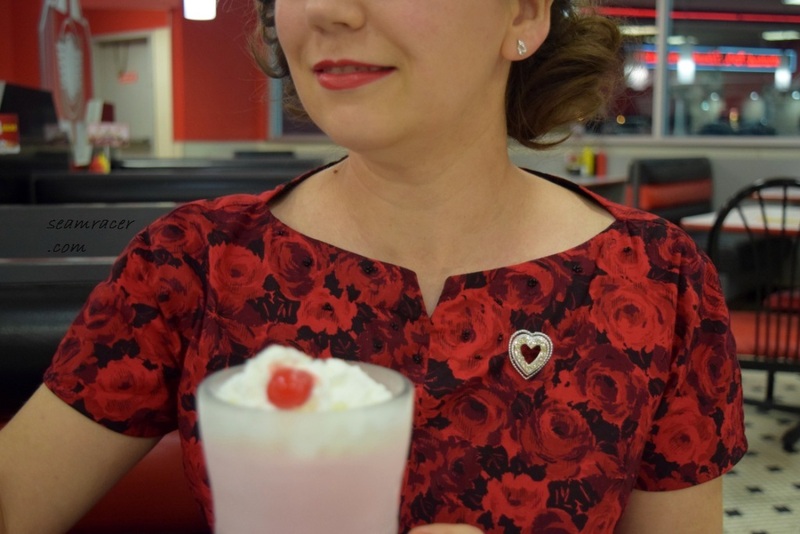 I was at one of the original “Steak n’ Shake” diners that luckily still looks old-fashioned enough for some pictures! The best roses I have seen yet! 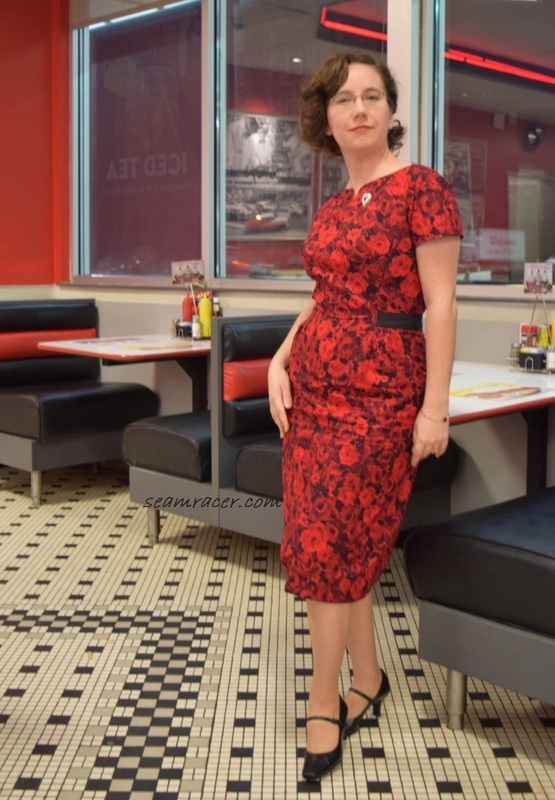 This is a very vintage elegant dress. I can see you put a lot of special care into your work. And your settings are perfect – I love coming back to see what you are up to now! Thank you as always, Linda, for such a kind comment! 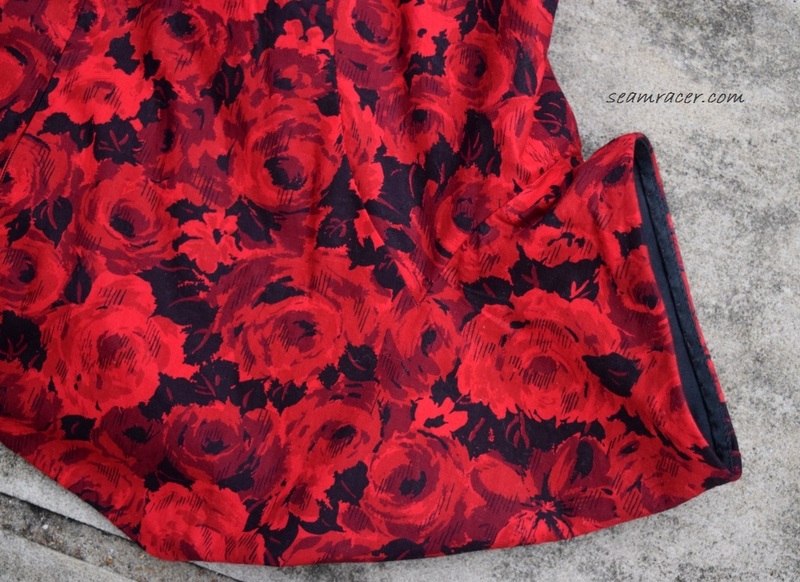 With the prices for real roses around Valentines day, this dress was the best deal for a bouquet ever! 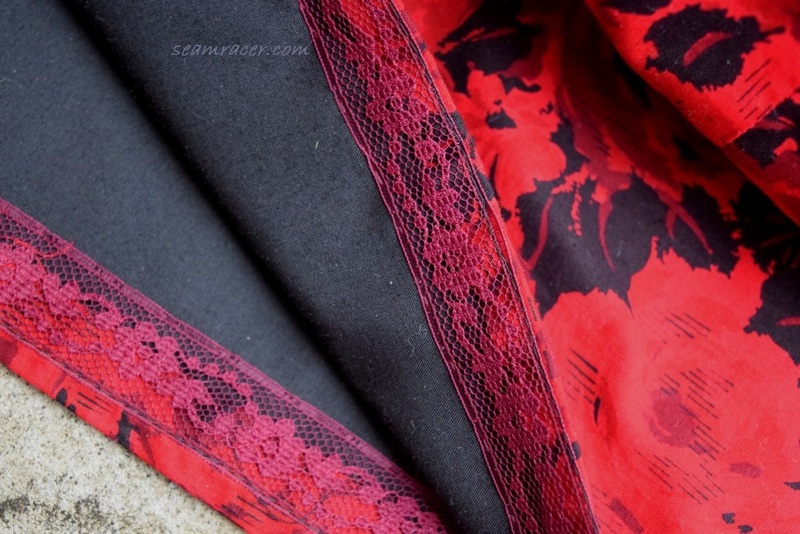 Funny thing is – I really didn’t have much time to get this done before the holiday so I was squeezing in hand sewing time at every possible moment…trying to balance quality with quickness! Absolutely stunning! 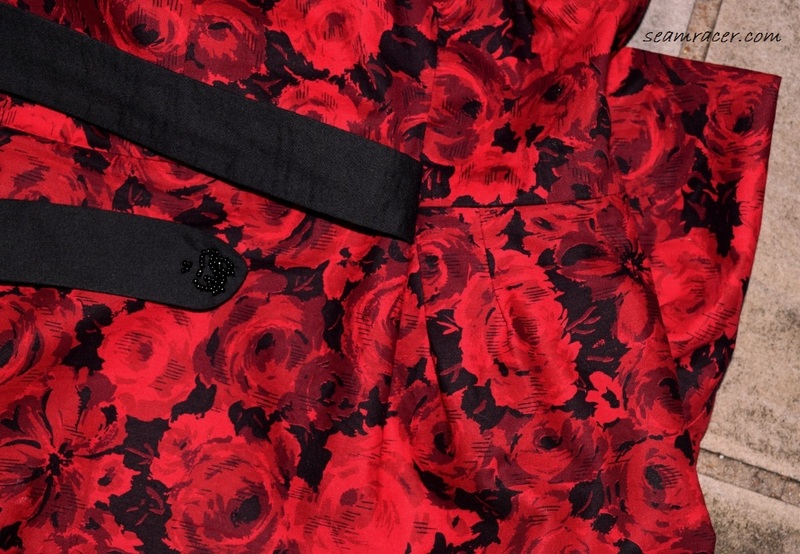 I love florals with a black background, and I love the old polished cottons…and you have done a beautiful job. SO much hand sewing! You put so much into your clothing; I have a lot of respect for your talents! This is my first experience with this kind of vintage cotton and needless to say I’m completely hooked! I do have mild carpel tunnel so hand sewing is not the easiest thing for me to do but a compression glove makes it better as well as working in stages. The finish and precision that comes of hand sewing is completely worth it in end result, I feel. Thank you for your lovely comment! 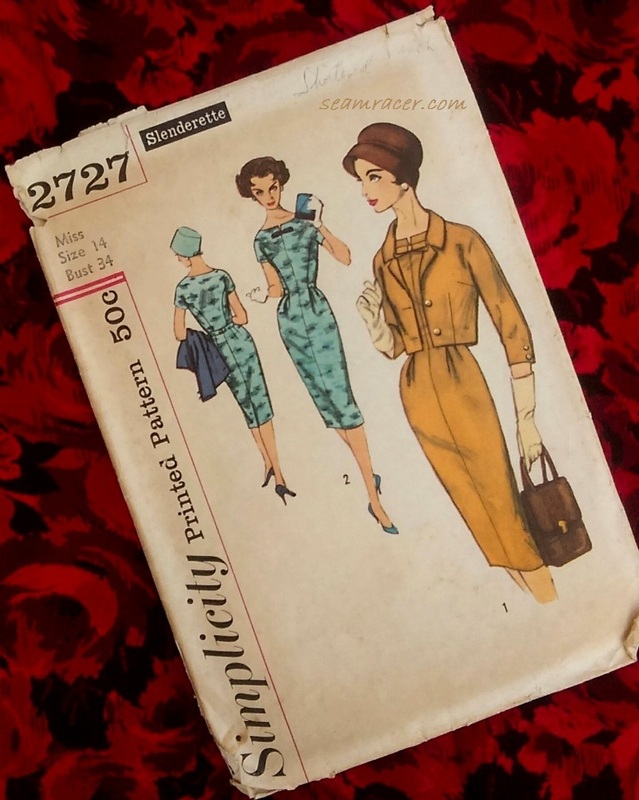 What a lucky fabric find! It seems you compromised in the right places to make it work, not sacrificing important aspects such as grain line. The dress looks great on you! 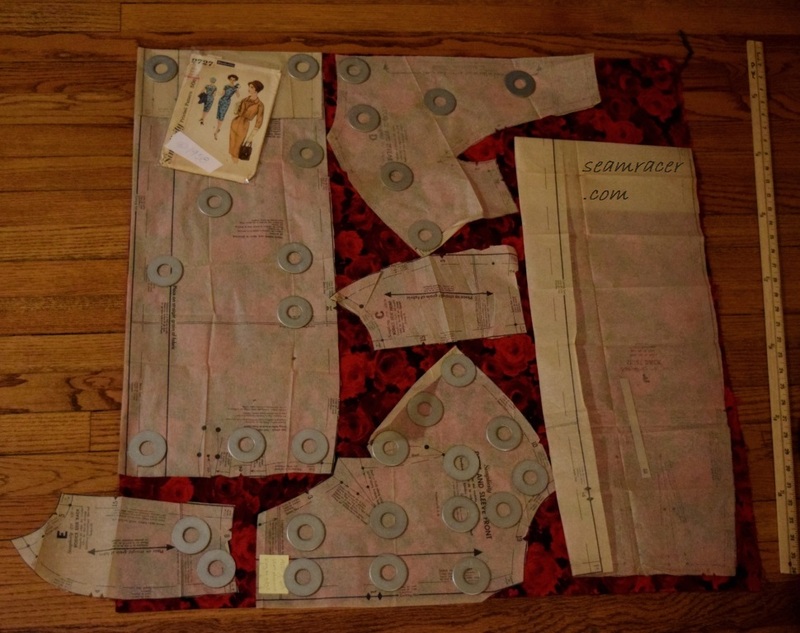 This dress’ pattern layout was an exercise workout for my brain…so exhausting to figure! I definitely had my work for this project, my stubbornness comes in handy sometimes, he he! And yes, I do not like to compromise grain line, I do think that’s important to stick to. Thank you for your comment, Quinn!